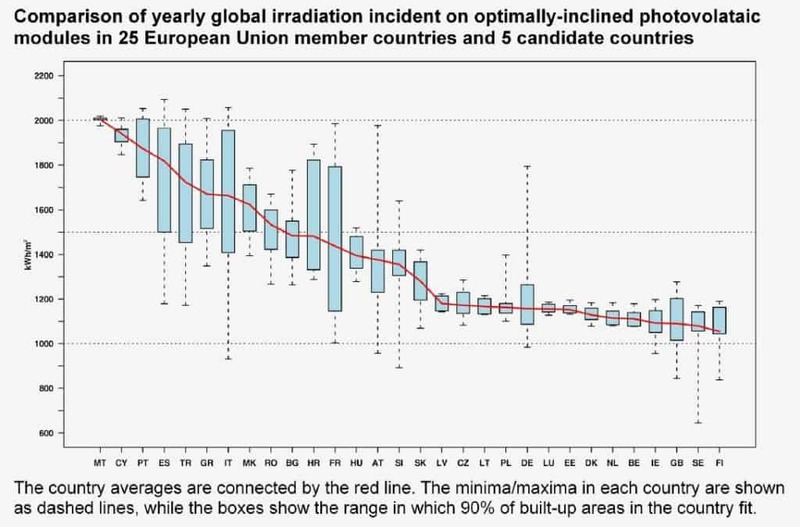 European solar irradiation map annual data serves as an excellent tool to calculate your produced energy with your solar photovoltaic system in Europe. EUROPEAN SOLAR PHOTOVOLTAIC IRRADIATION MAP ANNUAL DATA IN KWh/m2. CLICK to view image. Data from European Commission Joint Research Centre Institute for Energy and Transport PhotoVoltaic Geographical Information System (PVGIS). Already today, the profitability of your home can be determined by your roof and the installed PV power. Any PV solar system is not only a clever investment in clean and safe energy but in the future also an charging station for electric cars and in some cases an additional pension. What are ways I can finance a solar installation in 2018-2019 in the USA?